This film was a mixed bag. It tried to be This is Spinal Tap for hitmen but didn't make it. Killing Gunther is Killam's directorial debut. Killam is a SNL veteran. So often, this movie does feel like an unnaturally extended SNL skit. I thought that the premise was humorous. The film's energy flags occasionally. I think that the hour and a half long Killing Gunther could have dropped about 20 minutes from its running time and done okay. It's action comedy film that mixes slapstick, Airplane like sight gags, and black comedy to decent if not great impact. The first 20 minutes I laughed out loud quite a bit, after that, not so much. If I had seen this in theaters I probably wouldn't have thought it worth the expense and trouble of going to the movie theater. It was okay as a Saturday afternoon film. Although some more squeamish people may be turned off or even offended by the premise, the movie is not all that different from any number of comedies set in corporate offices or shady bars where a bunch of lovable losers come up with their planned big score. I was reminded of Welcome to Collinwood. 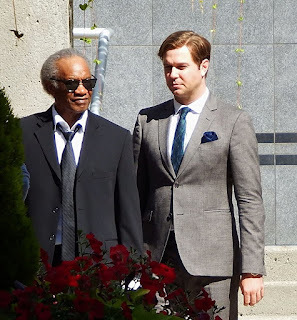 Blake (Killam) is a somewhat louche, highstrung, world class hitman. Although he's good at what he does he's by no means the best. That appellation is reserved for the target of his ire, Gunther. Nobody knows what Gunther looks like. Some people aren't even certain that Gunther is a man. Everyone agrees that Gunther is the best. Maybe he's the best ever. Gunther takes on impossible hits and makes them look easy. Gunther shows off and steals all the best jobs. He makes other assassins look bad. Blake resents not being number one in his field. Blake decides that the way to set his own rep in stone as the man to see when you want someone murdered is to kill Gunther. As Ric Flair always says to be the man you gotta beat the man!!! Blake also has some more personal reasons for wanting Gunther dead. These become obvious later on in the film. Donnie (Bobby Moynihan), Blake's best friend, a portly explosives expert who declares his undying friendship for Blake in one breath while stating in the very next that he'd carry out a contract on Blake, no problem. Ashley (Aubrey Sixto) Blake's criminal mentor and father figure, who is having trouble staying out of the hospital. 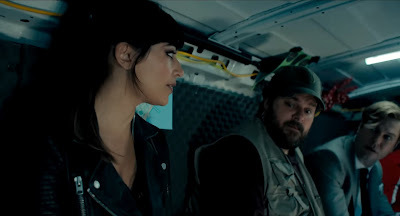 Saana (Hannah Simone), a voluptuous Iranian markswoman who is skilled with any and all guns. She has an extremely proud and overly protective retired assassin father Rahmat (Peter Kelamis) who wants to help his daughter break the murderous records he set. Izzat (Amir Talai) an easygoing former terrorist who became an assassin because the money and hours were better. Yong (Aaron Yoo) a fey master poisoner who becomes violently ill at the sight of blood. Gabe (Paul Brittain) a quirky, fussy and occasionally incompetent hacker and computer expert. Max (Steve Bacic) Blake's former partner. The brother-sister team of Russian killers Mia (Allison Tolman) and Barold (Ryan Gaul) who never use one pound of dynamite when they can use one ton instead. They are more interested in seeing American landmarks than they are in killing Gunther. In order to prove that it was his idea, his organization, and hopefully his bullets that take out Gunther, Blake hires a documentary team to film him and his team in action. As you might imagine things don't go so well. There are disagreements about whether everything should be filmed. Gabe takes everything literally and shows no initiative. Blake isn't always the dashing resourceful leader he imagines himself to be. He's still trying to process complicated feelings about his great love who got away, Lisa (Cobie Smulders, Killam's real life wife). It is always funny how people often say they don't give two flying figs about their old special rider but nevertheless are usually curious as to what they are doing. It quickly becomes evident that somehow Gunther (Arnold Schwarzenegger) knows all about the team hunting him. And he's turned the tables. Each setback makes it more apparent that Blake and company are in over their heads. The introduction of the various characters and the almost immediate deconstruction of their presumed competence was funnier than anything else in the movie. Unfortunately that was over in about 15-20 minutes. The funny parts were good but the rest of the movie might only get a few chuckles. Schwarzenegger appears to be enjoying himself. His role is really more of an extended cameo at the end of the film. He's winking at the camera. The film makes a few references to past Schwarzenegger roles. Be aware though, this is not a Schwarzenegger film. If you watch this film looking for him you will be disappointed. As stated, the conflicts and attractions among the members of the group and their various reasons for being there were more interesting than the actual mission. These conflicts weren't dependent on being mercenary assassins. They would have been familiar to anyone working in a corporate workplace. Killam probably should have spent more time examining some of that. The subplot with Lisa is sweet but entirely predictable. The Ashley storyline falls flat. Blake does remind me of some mid level managers I've known who attempt to paper over their inexperience or incompetence with bluster, sarcasm and aggression. This is not as funny a film as it could have been. Decent, not hilarious. But as always YMMV.